upstairs, Bank of Sardis on the corner H. & W. Pyles, 1891. Former WWII p.o.w. Billy Cracraft shows off his catch. from a John Henderson Facebook post. 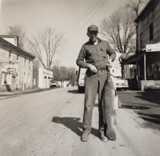 Tatman's on the left; Fulton's Gas Station; Doyle's store, and home; and Kip Reed's Sardis Service Station. The car belonged to Owen Wayne Ormes. built by J. M. Wheatley. Opera Houses of this era presented all types of entertainments. School plays, traveling shows, low-brow comedies, recitals, and lectures. Opera? Virtually never. Letter writer is disturbed that he can't get help in capturing a slave escaped from Sardis. Preacher against night riders loses his job in Sardis in this episode in the Tobacco Wars of 1908. Sardis was incorporated as a town by an act of the Kentucky General Assembly on February 14, 1850. The creation of the Mayslick and Sardis Turnpike Road Company, here. “The Sardis and Silvia [?] Telephone Company has been incorporated with $225 capital stock by T. W. Todd, Robert Hudson, and Frank Rogers.” Telephony, Vol. 80, p. 1921 “Taylor Berry and Hugh French have bought the interests of R. O. Chambers and D. H. Hindreth in the Sardis Flour Mills.”from The Operative Miller, Vol. 24, 1919. In Sardis, sold pigs find their way home - 7 miles away. Read it here.